Norvell is a shortened form of the name de Normanville. It dates back to 1190 when John de Normanville witnessed a grant of land by Bernard de Hauden. In 1200, Hugh de Normanville and Alicia, his wife, exchanged land. Various other land transactions involving de Normanvilles were recorded over the next century. The name signifies someone who lived in or near de Normanville. Scotland had two towns with this name. The earliest Norvells appear in Scotland about 1373, when Robert Norvyle witnessed the transfer of lands in Fife by Sir David de Wemyss. John Norvaile and George Norvil appear in Perth about 1471, and Adam Norwald was a witness in Perth about 1574. Others: William Norwell, who represented Sterling in the Scottish Parliament from 1568-1586; John Norvell, who was a Burgess of Stirling in 1596; Gilbert Norvell, Burgess of Aberdeen in 1605; Jon Norwall, a merchant Burgess and guild brother of Glasgow in 1619; Alexander Norwall, a notary in Carlulie in 1656. The family coat of arms as described in Burke’s General Armory depicts three black martlets (swallows or swifts) on a silver diagonal band across a black shield. 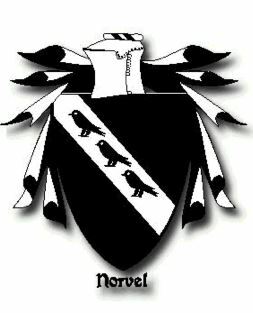 In the 17th Century there existed many spellings of the name: NORWELL, NOVELL, NOEL, NORRELL, NORVILL, NEVILL, and NORVELLE; but by the 18th Century they had generally become NORVELL. In the new world the name would evolve again to NARVIL, NORVILLE, etc. due to phonetic spelling and regional dialects. Little is known about the early history of the Norvell family. The family always said that they were of Scots origin. They were a small family, and there are only a few records that mention the name. They lived in the Stirling area where they were low-landers and farmers. Followers of John Calvin, Protestant reformer of the Sixteenth Century, Vestrymen of the early Presbyterian Church, they practiced of a very stern moral code. The low-landers suffered much from the raids of the highlanders of Scotland. They also suffered for being Protestants in a Catholic Scotland, and, as a result, their loyalty was with the Kings and Queens of England instead of their native Scotland. Sometime in the late Sixteenth or early Seventeenth century, the family moved to England, where they became a part of the early group that settled the Colony of Virginia in the New World from about 1630-1650. Excerpt from my book, History of the Norvell and Related Families (3rd edition, 2006, private printing). PDF is avalible for no charge, please contact me.